Percy grew up not knowing his dad and the truth about the other side of his family. It took losing his mom temporarily, being thrown into a world he didn’t even know existed, and being accused of as the world’s most wanted thief for him to meet his dear old dad. Good thing, Percy’s one of the strongest (if not THE strongest) demigod alive right now! Percy is known to be a laid-back dude most of the time, and prefers to wear simple clothes. 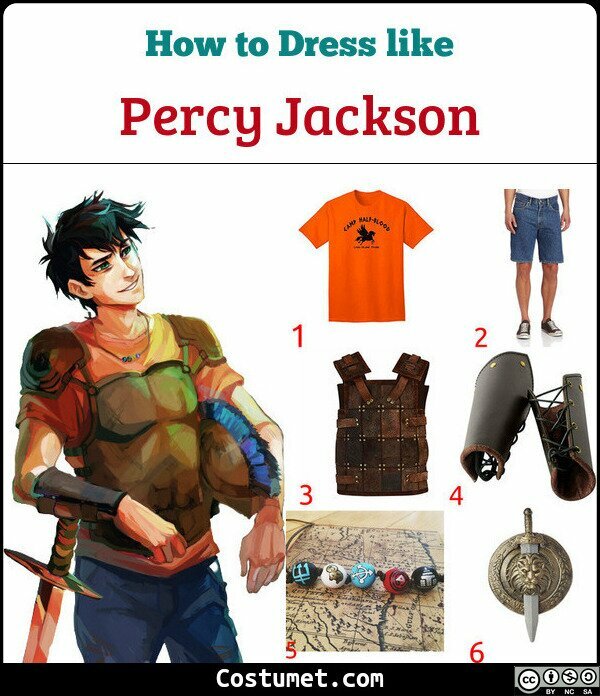 For this outfit, Percy is wearing his orange Camp Half-Blood shirt, denim shorts, brown leather armor, and his camp necklace. Here’s everything you need to look like Percy Jackson. 1 Orange Camp Half-Blood Shirt Percy is part of the Greek demigod safe haven called Camp Half-Blood so he usually wears his orange camp shirt wherever he goes. 2 Denim Shorts Percy loves relaxing so a pair of denim shorts is the way to go. 3 Brown Leather Armor Demigods’ version of Capture the Flag can be quite dangerous so Percy protects himself with brown leather armor. 4 Brown Leather Arm Guards A pair of brown leather arm guards are also good protection. 5 Camp Half-Blood Necklace Each camper has a beaded necklace to represent the years he’s been in camp. You can use this awesome necklace as a substitute. 6 Gladiator Sword It doesn’t have anything against Riptide but this gladiator sword is a good costume alternative. Percy Jackson was portrayed by Logan Lerman for the two film adaptations of the book series. Lerman is also known for his role as Charlie in The Perks of Being a Wallflower. Georgie is a cute young boy who is mostly remembered because of his yellow, hooded raincoat. He is also usually depicted holding a red balloon from Pennywise. It comes from hell, dressed like a nightmare, to preys on your life. Hagrid often wears a brownish leather jacket on top of the regular shirt and topped with a long leather coat, and leather pants. He also likes to wear boots and big belt. Some of the links may be affiliated. When you buy through our links, we may earn small commision. Read Full Disclosure. Thanks for supporting us.